There’s nothing quite like eating out at a country pub at this time of year. That feeling of getting out of the cold by stepping into an inviting, cosy ambience where you know a warming feast awaits you makes my stomach positively tingle just thinking about it. The Lazy Toad at Brampford Speke created just that for me when I visited after putting together last month’s walk feature. The décor can quite easily be described as how the owner, Harriet, responded to a group of visiting American tourists when asked what the theme of the interior was – ‘English Country Pub’. 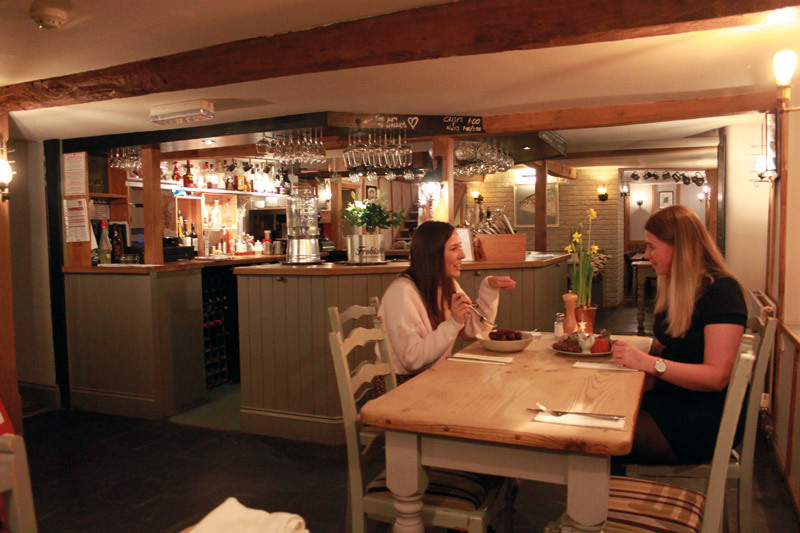 It’s a modern representation of a quintessential country pub with farm implements decoratively hung on the walls, wooden beams, a cosy fireplace and other olde-world artefacts to peruse. A number of local ales and drinks are available including the Lazy Toad’s signature ale in partnership with St. Austell Brewery – The Lazy Toad Tipple. This rich, rounded ale made for easy sipping and adds an extra something to get the mood steered in the right direction from the outset. You immediately feel as though the details have really been thought about to create the bigger picture. I’d highly recommend this when visiting. 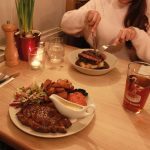 As you’d expect with quality dining these days, the produce is as fresh as it comes and locally sourced wherever possible thanks to the pub’s ‘buy local’ policy. 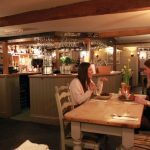 Burrow Farm, Forest Produce and Dart Fresh head the bill of just some of the highly revered suppliers in the area. A variety of herbs and veg is also lovingly grown in a polytunnel on their very own smallholding too so you know you’re eating seasonally and as fresh as it gets. Not just that, but we were told that everything on the menu, except for the olives, is produced in-house – even down to the mayonnaise and their delicious ice cream. 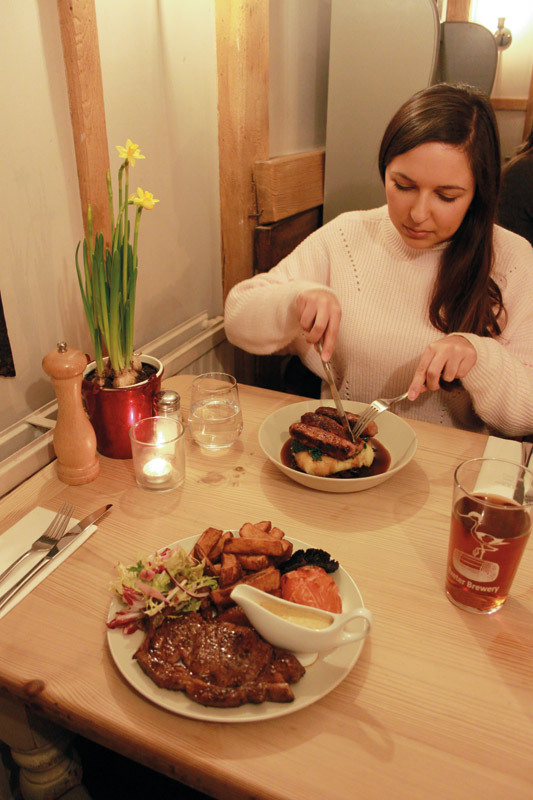 The menu is constantly evolving, changing with the seasons but retaining staple favourites that aren’t going to alienate frequent visitors or those looking for a simple pub classic. 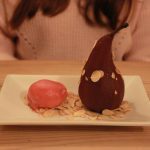 We were told that the head chef has free rein as to what exactly he decides to include on the menu, making it fun and reflective of his creativity which we really liked. I imagine this gives the chef and kitchen crew a real sense of pride in what they do and that was reinforced by having him come out to see if everything was to our liking once we had finished our meal. A nice touch. A Potato & Leek Soup (£6.95) to start was creamy without being sickly, making for a comforting winter warmer. The Breaded Gorgonzola starter (£6.95) was paired beautifully with the sweet redcurrant jelly to offset the more bitter flavour of the cheese. Certainly not a ‘pretentious portion’ either. 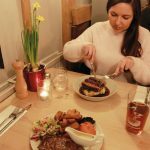 From the start it was clear that at The Lazy Toad it’s about good food cooked well and ensuring nobody leaves feeling hungry. The Trio of Pork & Honey Sausages (£14.95) were attractively stacked atop the buttered mash and seasonal vegetables before being drizzled with gravy for a decoratively thought-out dish that was full of flavour. 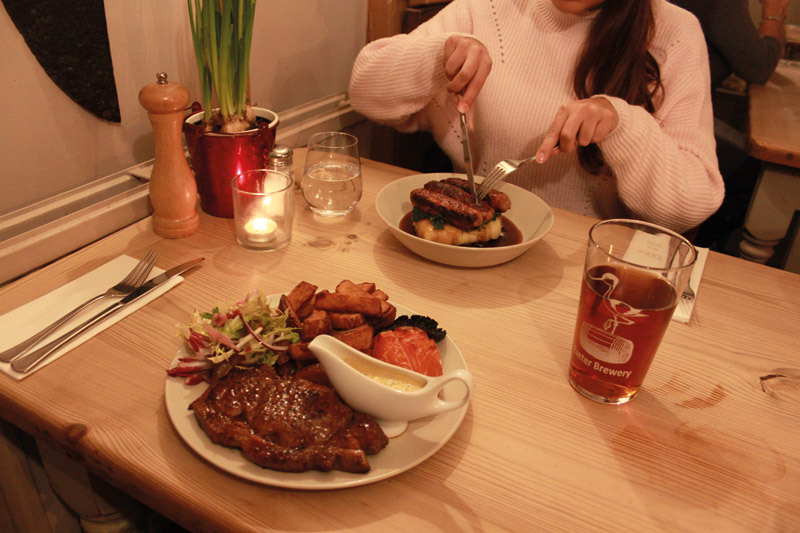 The 8oz Sirloin Steak (£22.95) was served with a whole roasted tomato, roasted Portobello mushroom, and beautifully crisp but fluffy hand cut chunky skin-on chips. Dessert was taken care of by way of a light but indulgent Lemon Posset (£6.95) with fruity hints of berry coulis and a welcome crunch from the crumble top. 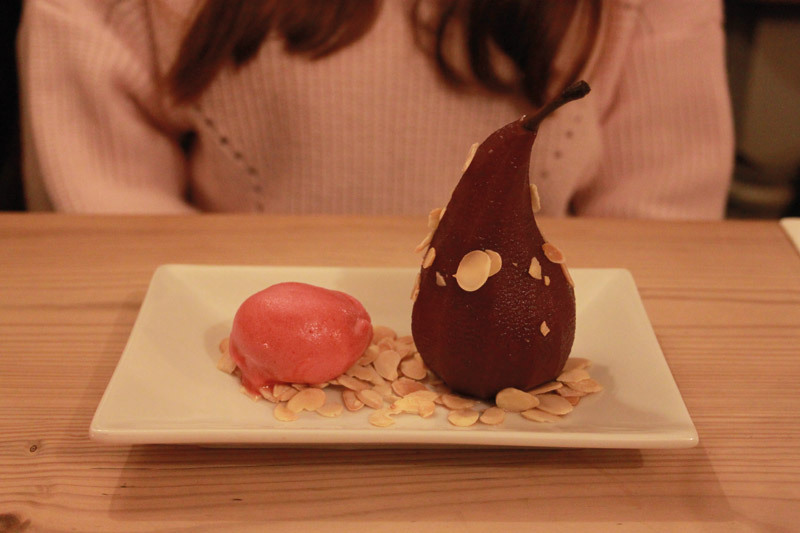 The Red Wine Poached Pear (£6.95) was particularly eye-catching and made for a unique dessert offering – paired with the sweetness of a berry sorbet. 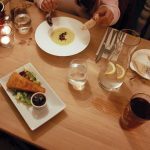 We particularly enjoyed the service provided by our waitress; attentive without being intrusive and genuine friendliness delivered politely alongside a confident knowledge of the menu. This left us feeling special and doted upon like you would hope when out for a nice meal but still comfortable enough to have a chat and a joke. 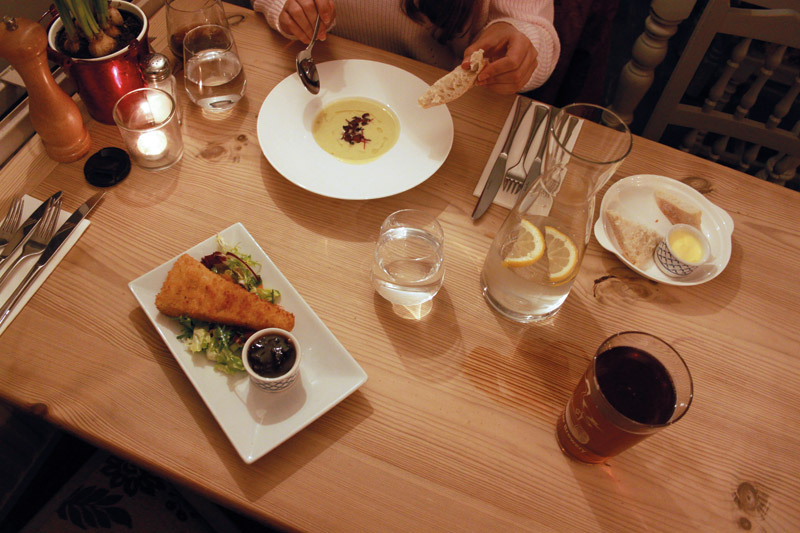 Thanks to its ease of access from the A377 to Crediton (signposted from this road), The Lazy Toad best serves those who live on the North and West of Exeter and want to escape the city for a sophisticated yet comfortable and relaxed evening out. But, that being said, the long list of awards – including a Taste of the West Gold Award – means it’s well worth travelling to from further afield too. Pair with the circular walk in our January issue and you’ve got the perfect recipe for a day out in the country.